In today’s world, where technology is king, everything has changed in one form or another. Nothing is immune, including the music industry. Music has changed dramatically, with many individuals turning towards a digital format, in order to play their music. It is certainly true that this offers many conveniences, but many music enthusiasts will agree that music isn’t the same, unless it is played in the old fashioned manner, on a good old turntable. This helps to produce the sound the way it was supposed to be, while providing a little nostalgia to all of your favorite music. So, what is a turntable? Well, according to the definition, this is nothing more than a circular plate, which forces a record to spin, as it is played. Of course, for the music fanatic, these machines are capable of producing the clearest and highest quality audio. In the overall concept of things, turntables are one in the same and suit the same purpose, but there are many differentials between them. Although they may look similar and work in the same manner, they’re inner workings and features can differ significantly. For instance, there are belt-drive turntables and direct-drive turntables. With the belt version, there is a motor and a belt, where the direct-drive turntables are featured with a motor, which is directly connected to the spinning platter. At the same time, it is possible to discover manual and automatic models. If you’re looking for total convenience, you’ll find it with the automatic operated turntables. With these, you simply take the record, place it on the platter and hit the play button. With the manual tables, you’re required to actually lift the tonearm and put it into place, before it’ll play. At the same time, you’re also forced to manually shut off the machine, when the music and concluded. There are also a variety of different features, which make all machines different. The phono preamp may very well be internal or external. You can now find turntables, which are equipped with USB slots. This offers a tremendous amount of convenience and new accessibility to digital records. Finally, you will also find record payers that are equipped with different cartridges. Each of these features is equally important and you should consider all, before making your purchase. 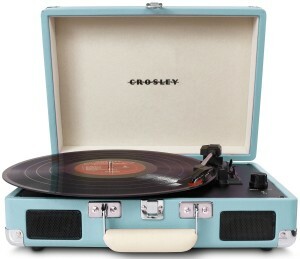 What is the best record player ? In all truthfulness, the best turntable for one music lover may very well be the worst for another. Each enthusiast will have a unique opinion here, which makes it somewhat difficult to give one turntable an advantage over another. However, there are specific characteristics and features that are usually sought after. By selecting these specific features, you may be able to make a better purchase and receive better sound or more longevity with your new turntable. 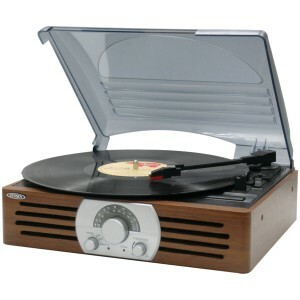 For starters, most individuals recommend choosing a direct-drive turntable, which is beltless. The belt, although it may be effective in some regards, can add another unnecessary component to the machine. Belts are not invulnerable and can be damaged with repeated use. Therefore, it is helpful to choose the turntable, in which the motor is hooked directly to the platter. If you’re also a techie, you should consider purchasing a turntable, which is equipped with USB accessibility. This will give you the ability to transform your favorite music to MP3s. Since most music is available in digital format, this offers a lot of convenience and will allow you to play these songs on your turntable. And lastly, it is wise to determine exactly how you’re going to be using your machine. If you plan on taking it to a social function or friend’s house regularly, you may wish to invest in one that offers a little more portability. Although this may increase the price a tad, it will be more suited to your specific uses. As musical enthusiasts, we understand how important the right system is for perfecting the sound output. Over the years, we’ve experimented with a wide range of individual systems and turntables. Some were well worth the money, while others were more than disappointing. Below, we’ve compiled a list of some of the better turntables and have reviewed each one for your convenience. Overall, the Jensen JTA-230 is a nice, yet affordable, turntable that is packed with some helpful features. Setting up the turntable and using it straight out of the box will not be an issue, since it will connect to any regular power outlet. However, if you wish to hook this turntable to your own speakers, you will experience some complications. You must have an amplifier, in order for this to be possible. If this is your ideal setup, you may end up spending additional money, in order to succeed with this arrangement. Still, the machine’s audio output is very nice for the price. Although the machine is equipped with a manual arm, it still offers some convenience of an automatic turntable. It is equipped with an auto-on and auto-off switch. This will automatically kick the machine off, once the playback has concluded. Still, you’ll need to adjust the arm, whenever you intend to play, or finish playing music. 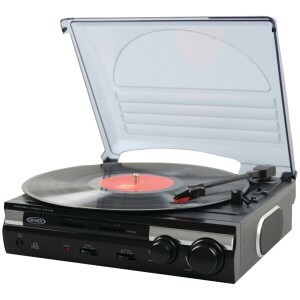 When looking at the turntable from a glance, you’ll see that it is tremendously designed and sleek. There is no need to hide this in your cabinet and you could very well leave it sitting on your countertop and ready for play. Numerous helpful features are available including the converter, which can transform your records into MP3 format. An RCA out is helpful, but the pitch and tone control will ensure that you get the right audio during each play. All in all, this is a wonderful package for the price. However, you shouldn’t expect to experience studio quality sound. At first glance, you’ll be able to recognize the improved quality over the previous turntable. You have a little customization option here, when it comes to color. Select between the silver design and the black, in order to match the particular color scheme or your home. This is a direct-drive model, which will prevent your from ever needing to replace a belt. At the same time, the USB hookup will provide you with total accessibility from your desktop computer or MAC. The device is compatible with an array of different software, which will help you get the exact performance that you desire. Surprisingly, the USB cable and adapter cords are provided, which makes up for the increased price. Overall, this turntable can be used right out of the box. A tad bit of configuration may be necessary for the tonearm calibration, but otherwise, you can get it up and running fairly quickly. All of the controls are easy to understand and use, which is nice. The biggest downfall of this machine seems to be the lack of audio cable, which is obviously too short. Otherwise, the high-torque motor is excellent and will never fail, which makes this an excellent turntable for the price. And, we have another turntable from the Jensen company. However, this one takes the nostalgia to the next level, with the old fashion design. 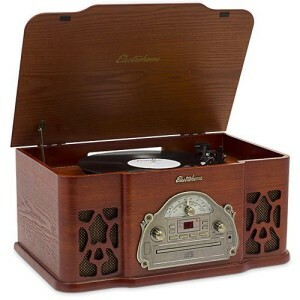 This is a multi-function machine, which can be used for an assortment of different purposes, including playing records, or listening to your favorite local radio station. With the overall tradition of things, you’ll want to ensure that you choose a station, which plays the oldies. The convenient dust cover helps to ensure that all of the internal parts remain safe and protected at all times. Although the design is sleek and stylish, the turntable, which is 5x12x11, can be easily stored away and out of sight, if this is your desire. While the device is capable of being connected to your home stereo system rather easily, it is also equipped with sufficient front speakers, which offer tremendous sound. Unfortunately, the lacking features may be detrimental to the overall value. The machine is incompatible with any computers, since it does not include a USB port. Therefore, you will not be able to take advantage of your computer’s audio software. Still, if you’re looking for total nostalgia, this may very well be your best bet. Thus far, this is the most customizable and portable on the list, despite a low price tag. An array of cool colors is available to ensure that the turntable’s case matches your personality and the color scheme of your home. When the case is closed and the internal pieces are concealed, you’ll be able to carry the player around like a briefcase. The turntable is also equipped with an optional plugin, which will enable you to play the sound through external speakers. Despite the awesome design and convenient transportation, this record player is somewhat lacking in some areas. For starters, there is no USB port, which will restrict your ability to convert your music. At the same time, this is a belt-driven turntable, which may very well give you concerns. If you’re looking for total customization, a fun design and something that is easily portable, this may very well be the best selection for your money. Right out of the gate, this turntable is completely stylish and beautiful. Suffice to say, it provides the best antique appearance on our list. The wooden exterior is homey and will look perfect sitting on the top of your fireplace, but this isn’t all that makes this record player a good buy. The automatic arm will provide you with a little added convenience and the machine can pretty much be used right out of the box. Just tear through the packaging, unveil the awesome player and plug it in. From there, you’ll be listening to your favorite old tunes, while relaxing on your recliner. Of course, this is actually more than a turntable. This record player is actually capable of playing three different formats of music, including records, CDs and even AM/FM radio. An additional 3.5mm auxiliary port ensures that you’ll be able to play music from your favorite storage device, whether it is you iPhone, iPad or some other MP3 player. Sadly, there are some potential negatives here. The machine isn’t equipped with any USB connectivity ports, which may influence your decision. At the same time, the record player itself is belt-driven, which may be detrimental to the longevity of the player. Still, there is plenty to like about this machine, as long as you aren’t looking for something portable. 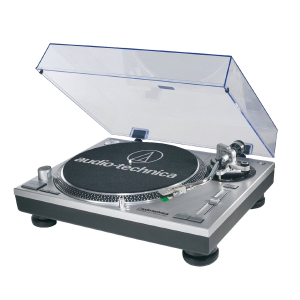 At the end of the day, any of the above mentioned turntables could be suitable for you and your needs. Each musical enthusiast will be looking for something different, which is why it is imperative to read our reviews and make an educated decision based on your preferences. From there, you’ll be reliving the past, as the music transports you back to the old malt shop, where you used to enjoy those delicious shakes and dance around the jukebox.